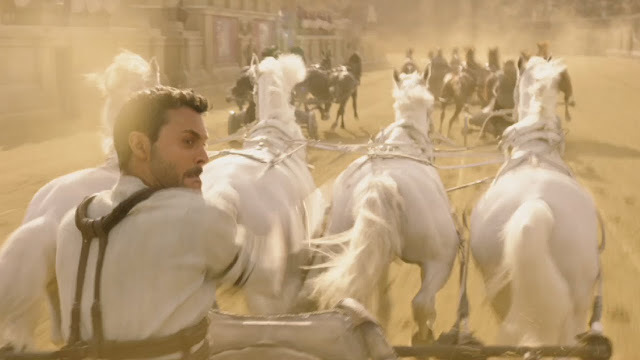 Home / MOVIE TRAILERS AND INFO / Get Inside the Action of "Ben-Hur's" Chariot Race Sequence! 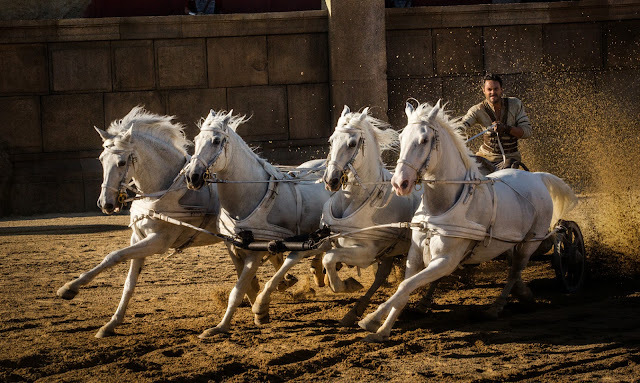 Get Inside the Action of "Ben-Hur's" Chariot Race Sequence! “Ben-Hur” is the epic story of Judah Ben-Hur (Jack Huston), a prince falsely accused of treason by his adopted brother Messala (Toby Kebbell), an officer in the Roman army. Stripped of his title and separated from his family and the woman he loves (Nazanin Boniadi), Judah is forced into slavery. After years at sea, Judah returns to his homeland to seek revenge, but finds redemption. The climactic moment of the film, Ben-Hur’s deadly chariot race against Messala, was shot over 32 days at Rome’s Cinecittà Studios. From day one, the decision was made to film the majority of the chariot race in camera, requiring twelve weeks of intensive chariot training for Huston and Kebbell. Though both had previous horse riding experience, racing with a four horse team proved to be a completely new skill set. "I’ve grown up with horses," says Jack Huston. "I feel very comfortable and confident around them, but there’s something entirely different when you have to control four of them simultaneously. The sheer strength of them is incredible. You don't just coast around a corner, you skid in that sand. It’s one of the most exhilarating adrenaline rushes I’ve ever experienced in my life." "When you come out the gates, you’ve got another seven teams with 28 horses surging forward with you," Huston continues. "You have to play to the camera, but at the same time, you have to watch the action. It's like driving a racing car and acting at the same time." "The training was fascinating to me," says Kebbell. "We started with a horse and cart, then two horses pulling a chariot, then four. There was a big learning curve. What threw me at first was that no matter how many pushups and pull-ups I did, the parts I had to strengthen were my fingers. The fingers have to be able to divide your strength between four horses to control them." "I think at first Jack and Toby thought, ‘How hard can it be?’ Henderson speculates, "But keeping control of all four horses is an incredibly physical task. They have the ability to get away from you at any moment, so you have to stay on top of that. It's not only about your safety but the safety of everyone around you." "We got some incredible footage of Jack and Toby driving the chariots at a full gallop," says Horse Master Pete White. "You can clearly see that is them neck and neck on the track."